Northallerton maintained their unbeaten start to life in Yorkshire 2 with a hard fought but well deserved 11-25 win away at Leodensians. The first half was played mostly in driving, heavy rain, but it was the home team who adapted and coped the better early on. As last week, North started slowly and found themselves 11-0 down after the first twenty minutes due to a unconverted try and two penalties. As well as the slow start, North also gave away four penalties early on and must learn to improve their game from the start instead of relying on comebacks, which is a risky strategy. After twenty five minutes North got their catch and drive going from the half way line all the way to the Leo’s 22 line before being halted. North however, managed to recycle the ball and Iain Swall drove over in the corner for a unconverted try. North kept the pressure on the home side with New Zealander Ashley Rio pulling the strings from fly half. It was Rio who took North into the lead with a delicate grubber kick through which he followed up himself and touch down under the posts for a try converted by himself. North then kept control of the game up to the half time whistle. Thankfully the torrential rain stopped at half time, making both the playing and spectating conditions more bearable. Straight from the restart, North reclaimed the ball before earning a penalty with Leo’s over eagerness with their hands in a ruck. North opted for the lineout just inside the Leo’s 22. With the opposition expecting the usual catch and drive, Rio opted to send a looping miss pass out wide for Sam Taylor to score in the corner, the conversion from Rio drifting just wide. North remained composed during the second half and gave away very few penalties. Even with the introduction of Lee ‘yellow card’ Peake, North still kept calm knowing the game was theirs if they kept their heads. Five minutes later Rio made amends with a long range penalty to put North nine points ahead. After seventy minutes Leo’s were reduced to 14 men when their full back deliberately threw the ball into touch while under pressure from Joe Grieff and JP Skinner. From the resulting penalty, Rio sent a cross field kick perfectly into the hands of James Hopkin. Just as Hopkin was about to catch the ball though, somebody in the crowd shouted ‘PIZZA’ causing Hoppy to lose concentration and drop the ball over the try line. North however kept the pressure on the home team and were held up over the try line twice before eventually, shipping the ball out wide for Taylor to stroll over the line for Norths fourth, and bonus point earning try. 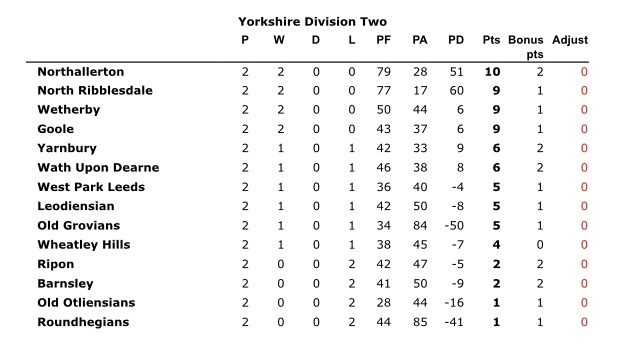 The bonus point put North top of Yorkshire 2 and although it is very early days they will hopefully be able to keep the momentum going next week at home to Barnsley with a 3pm kick off. Hopefully North will be have another 2 or 3 players back from injury next week, with the only doubt being Jeremy Deas who reported chipping a nail on his important Aldi packing hand. Competition for places is now becoming more intense with the silly rule of only 3 subs allowed, so attending training Tuesdays and Thursdays is more important than ever. Man of the match was awarded to Iain Swall who just edged out Rio.